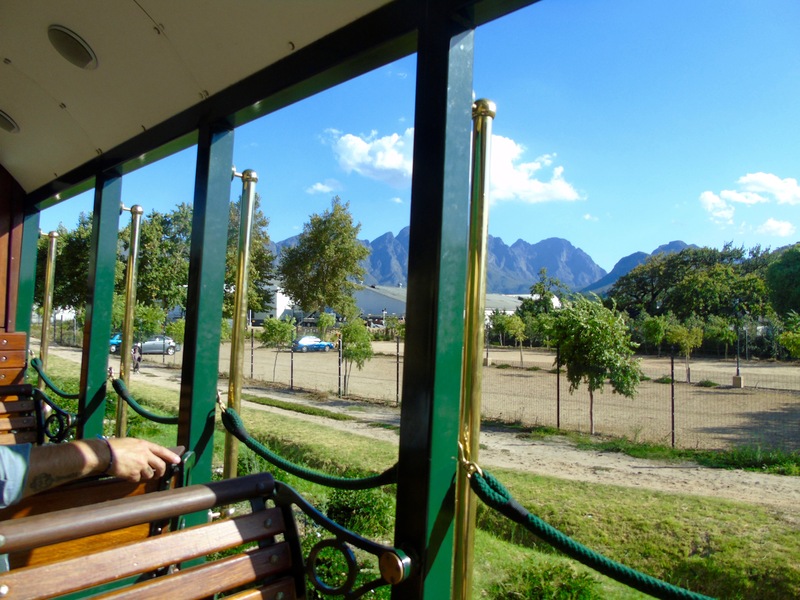 As promised, today we’re hopping on board the Franschhoek Wine Tram. 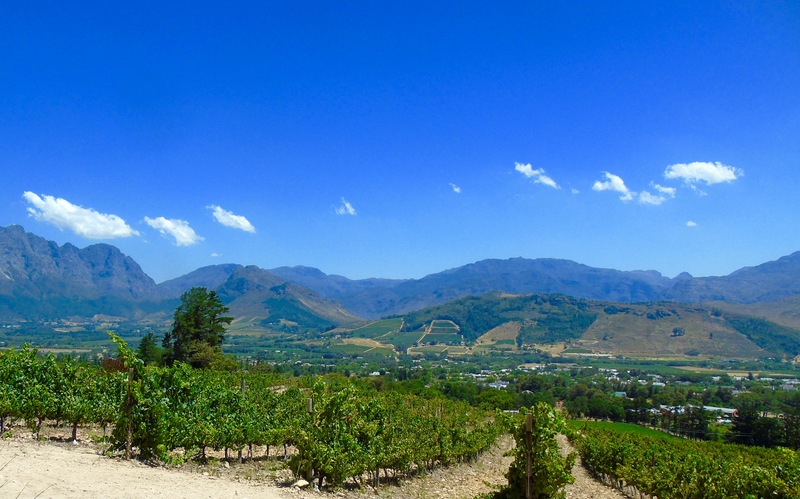 There are so many vineyards in Franschhoek in South Africa’s Cape Winelands it’s quite a daunting task to pick which ones to visit. So someone clever thought about starting up the Wine Tram to make it easier. There are five routes to choose from and seven or eight vineyards that you can hop off at for each one. We chose the Red Line, which has eight stops – and you have time to get off at a maximum of five. Clearly there is still some decision making to be done. 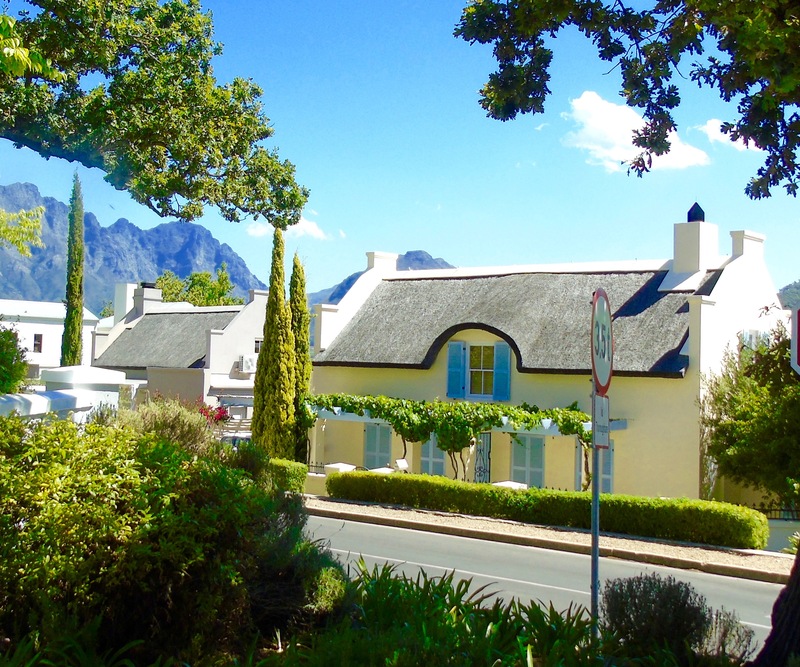 Anyway, select your route and head for the centre of beautiful Franschhoek to start your adventure. It’s worth getting there a little early for a fabulous coffee at Sacred Ground (how’s that for a great name for a coffee shop). Then wait for the bell to ring to announce the start of your tour and for your guide with the red (or whatever the colour of your tour) flag to appear. It turns out that the Wine Tram tours are mainly on a bus – well the actual tram only visits two stops which happened to be at the end of our tour. But you won’t be disappointed as it’s a particularly cute bus, resplendent in green and gold. The open sides make for easy picture taking and the informative commentary fills you in about the wine life in Franschhoek. 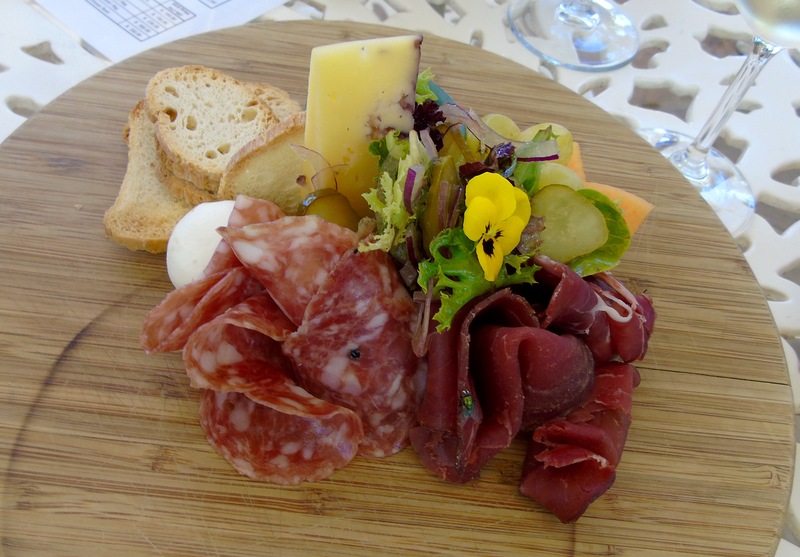 We headed out of central Franschhoek towards our first stop Maison. 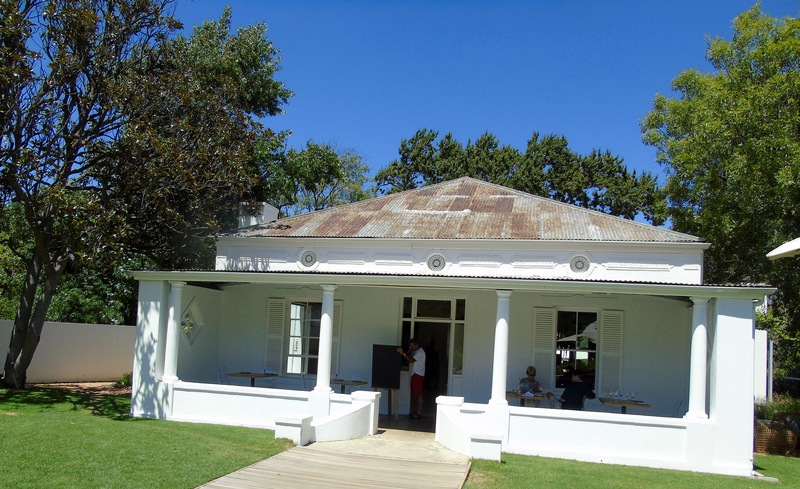 It’s a beautifully quaint little building with a welcoming verandah and tasting area in front. The restaurant – Kitchen at Maison – which is currently rated the eighth best in the country, overlooks vines and mountains. There’s a strict timetable to follow which actually makes life easier. Each segment is organised in periods of an hour – so when you’re dropped off watches are synchronised and the bus is back in exactly an hour. You can of course stay two hours (or three, or however long you want). We found that the hour worked really well. The farms are all used to the system and served us quickly and efficiently. So we were ready to head off to the next stop when the bus arrived. In the garden at Maison – a bit of natural art? We decided to skip the next two stops – Eikehof and Leopard’s Leap, though I did get the opportunity to capture this stunning sculpture from the bus. No prizes for guessing which vineyard this was at. 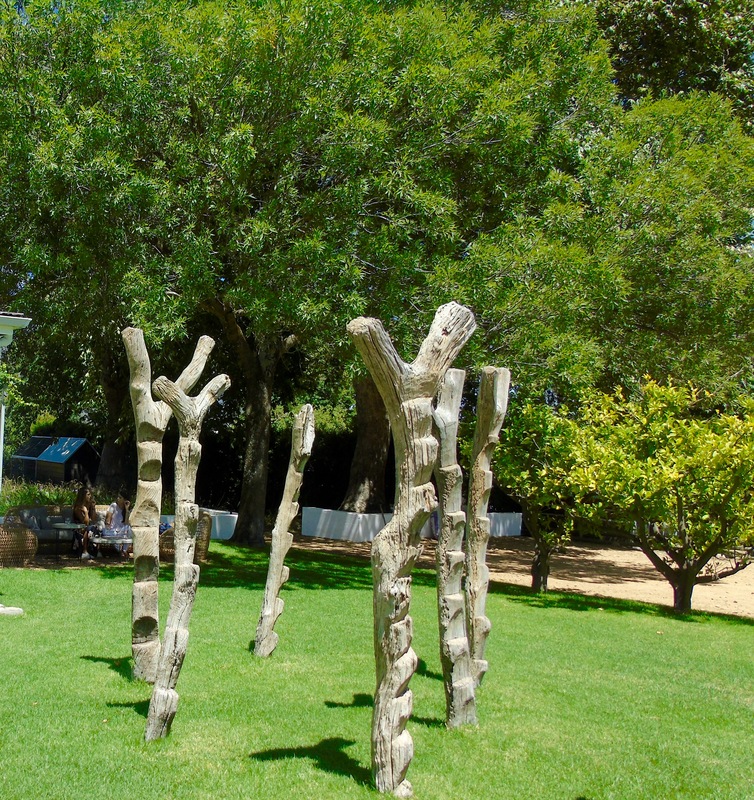 As well as all its other great qualities, Franschhoek is like a massive outdoor art gallery! Next stop Chamonix which dates back to 1688. The newly opened restaurant which overlooks the forest at the back. We tucked into the cheese and charcuterie boards because you’ve gotta eat if you’re tasting all that wine. They were beautifully presented and tasty, just what we needed. A short hop and we were off the bus again at spectacular Dieu Donne. It’s a modern construction, set high up on the slopes of Franschhoek with this spectacular view across the valley. The bus meanders through the streets of this historic little town – and it really makes you feel like you want to live there (or perhaps that’s due to the wine?). Beautiful views, quaint cottages and a sense of peace – I could picture myself moving into this house! By now the afternoon was starting to run away from us, time really does fly when you’re having fun. Finally it was time for the best bit – the actual tram. We waited excitedly alongside the track as it trundled up. 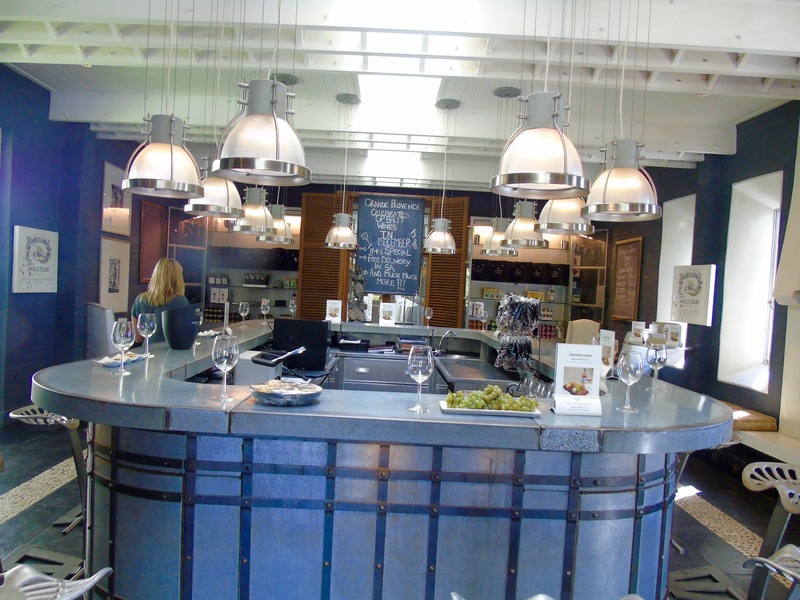 All aboard and we headed for our final stop – Grande Provence. On arrival at the station there’s a tractor and trailers awaiting you which trundle through the vines and trees to a beautiful destination. 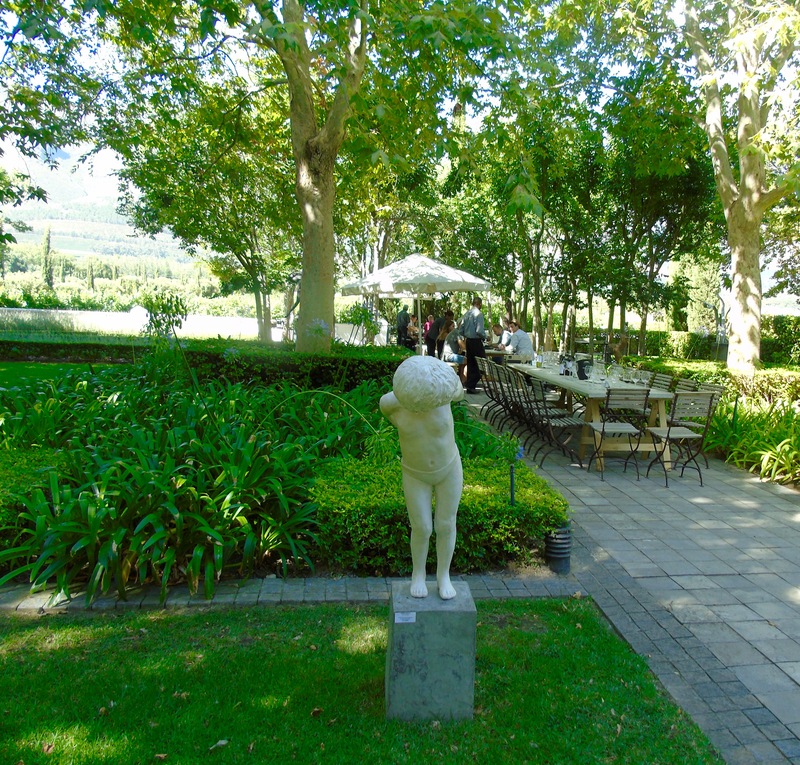 Grande Provence oozes class and style and there’s a very warm welcome, too. It’s over 300 years old and has the most spectacular gardens. 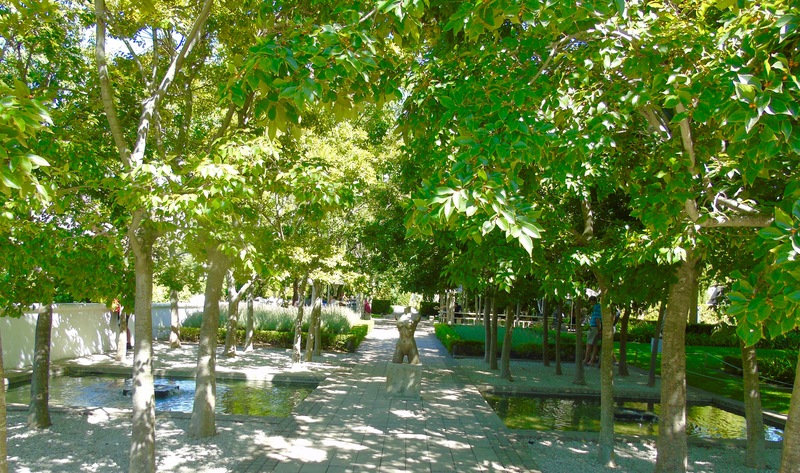 Beautiful trees, water features and art everywhere for your pleasure. And the wine is great too. We settled in the shady garden with a chilled bottle of Rose. The perfect last stop to complete our day. I loved our afternoon on the Wine Tram. We made new friends and sang with them along the way (wine tasting definitely helps with that! 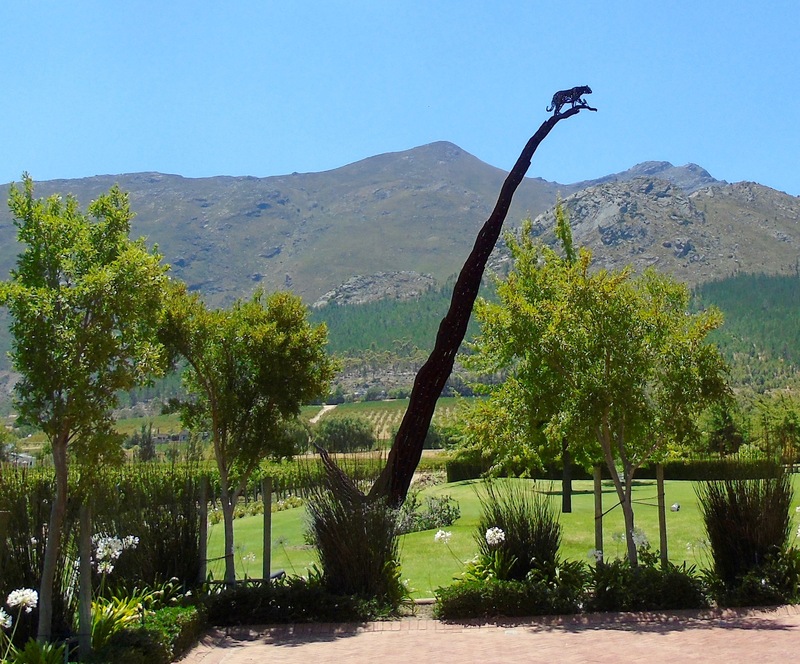 ), tasted new wines and enjoyed the beauty of the Franschhoek Valley in style. The Bus/Tram works like clockwork and is certainly a novel way to travel. They were all very different, a mix of historical and modern, varying views, food and wine. My opinion in short. Highly regarded restaurant, though we didn’t eat in it this time. Lovely cheese and charcuterie platters. Delicious Sauvignon Blanc with lots of citrus notes. The classiest of the lot. Beautiful gardens, water features and sculptures. Wow, Sandy! I had no idea about this wine tram! Is now definitely on my “to do” list! Hope to see you before you head back to the UK. Perhaps a braai at us end Feb/early March? We are off to Vic Falls on the 20th …..
You really should do it Shani, one of the most fun afternoons I’ve ver had. 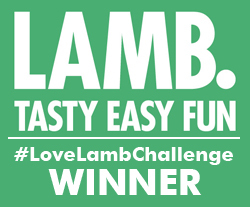 Would love to see you, definitely keen for a braai – we don’t have much on late Feb/March. Sounds spectacular Sandy! Well written and very tempting! Thanks Angie, you really should do it. So much fun! I’ve been to Cape Town twice now and still haven’t visited any of the wime farms (shocking) – this sounds like the perfect way to do it though. I’ll absolutely check it out when I’m back later this year. ha ha so funny how it is on the bus to start, although they have made it look very tram like! I wonder if they will start them in Nottingham where I live ha ha….. would be a great way to get home from work!! It does look like a really fun experience, I would defintely add it to my list! Mmmm, I love South African wines! 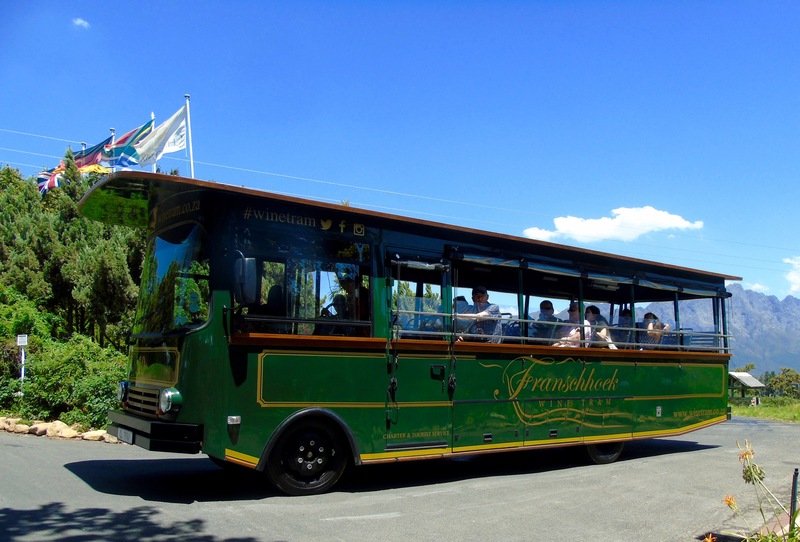 How lovely to take the green & gold (bus and) tram to the various vineyards. So much better than arranging a designated driver on your own. Wow!!!! This sounds like my sort of day out. 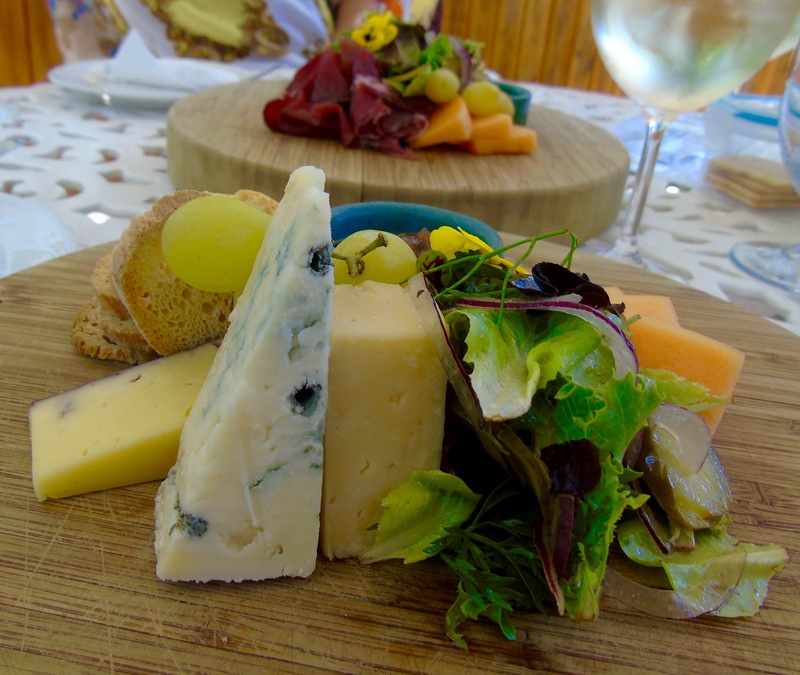 What a fantastic experience and those cheese and meet platters look gorgeous!! What an amazing idea – a tram to bring you around the winerys! Also what country’s this in? I couldn’t see it in the post. I would love to do this activity! A wine tram is such a wonderful concept! I’ve never heard of this before. Looks like a blast. It is such a great idea. We had a really fun day, made new friends, tasted lovely wine and discovered beautiful places. It really is a wonderful way to spend a day. Yes, the best name for a coffee shop ever! It is so much fun! It is in the Cape Winelands in South Africa, I must add that into the copy so everyone knows. Thanks. Absolutely, so much better. And there are seven different routes to choose from. I hope to do them all eventually – does that sound like a good goal? That is shocking, you really should make a plan to visit Franschhoek and Stellenbosch at least. They have made the bus look very tram-like and it’s very quaint. 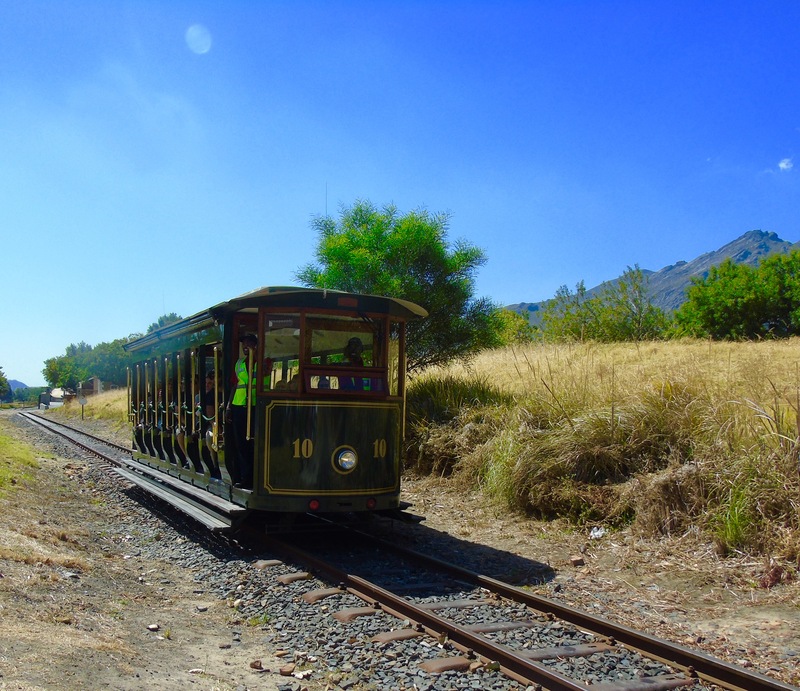 It would be awesome if you could get the Wine Tram home from work – maybe stopping off at a vineyard along the way! 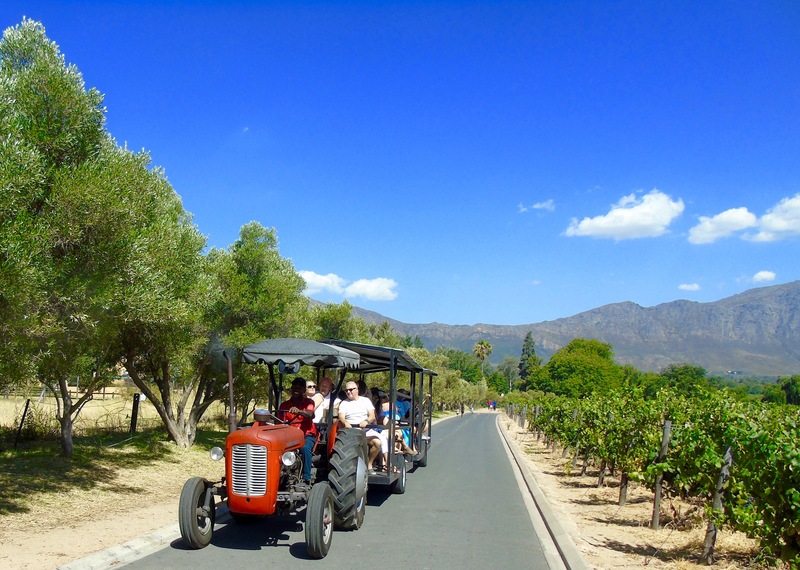 A fabulous way to spend an afternoon and explore some of the beautiful vineyards of Franschhoek. I can’t recommend it enough. Great idea to go on a tram for a wine tour. All the wines you described are so delicious, including that fabulous plate of cheese at Chamonix…Makes sense to keep everyone happy and safe on that quaint wine tram!! Sounds like a lot of fun!! It was such lovely afternoon! I can’t wait to do it again, and as there are quite a few different routes, it will be all new discoveries.